All transactions are safe and secure with a reliable history in online purchasing behind each of our associates. 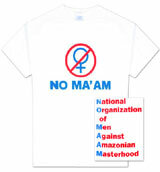 Buy the No Ma'am t-shirt to own Married with Children clothing and merchandise. No Ma'am. The National Organization of Men Against Amazonian Masterhood was created by Al and his friends to fight the growing power of women after it started interfering with their manly ways. Distinguished by their No Ma am shirt, this organization helps its members deal with daily stress through promoting bowling, beer and the nudie bar. Pledges are welcomed...to be humiliated. Just ask former pledge, Bud Bundy. In addition to the No Ma'am tee above, browse the Married with Children Clothing Gallery for more apparel like men's and women's clothes, kids shirts or hoodies.